Last Saturday evening, we went with some friends to beautiful downtown Blyth, to dine at Part II Bistro and attend the current offering at the Blyth Festival, “Garrison’s Garage” by Ted Johns. It was a particularly golden summer evening drive through some of the prettiest countryside in Huron County, where we who live here congratulate ourselves for not living in say… (name your least favourite city). We don’t have to fight traffic, construction (coz we’re not on Hwy 21), testy drivers and robber-baron parking attendants to enjoy a fabulous dinner and great theatre, at non-city prices. We all had tasty, beautifully presented appetizers and dinner at the Bistro, as we told the chef when he came out of the kitchen to see how his creations were received by the happy diners. Clearly the word is out on this comfortable but classy dining spot, as it was packed. Reservations are definitely a good idea. My only complaint- dinner was so good, no room for dessert! Next time. Garrison’s Garage was a hoot! Originally presented in 1985, the play stands the test of time, perhaps due to the timeless central theme- Canada Revenue vs. us poor schmucks, I mean Taxpayers. We can all relate, or at least I can, as how to complete my Income Tax is an abiding mystery to me. As is how my car works and why is doesn’t (usually at the most inconvenient moment possible) is another central theme of the play. It was a full house who frequently LOL’d, so clearly other Huron County residents and visitors share my bemusement re: the inner workings of the CRA and automobiles. We are really are blessed in Huron County! 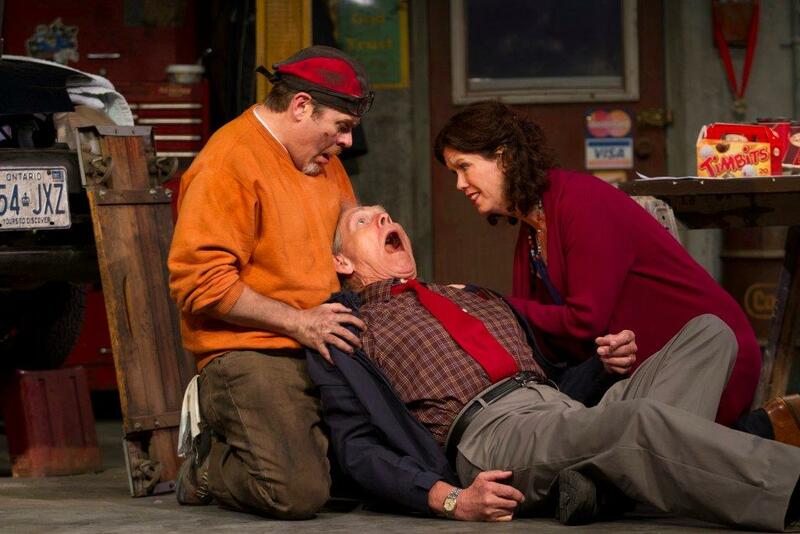 Garrison’s Garage runs in repertory at the Blyth Festival until August 31. Thanks for your thoughts on our bistro. I was just checking you guys out-and wondered if you had been by. I am married to Peter, the chef, and together, we own and operate Part II. Thanks for coming in..hope to see you again soon.